Eurovision Google predictor tool - using Search data to predict the Eurovision Song Contest result! UPDATE 17/05/09: Norway wins a landslide Eurovision victory, Google gets it right! John Battelle describes a search engine as a 'database of intentions' offering 'a place holder for the intentions of humankind - a massive database of desires, needs, wants, and likes.' Tuning into this data can therefore potentially identify front runners for popular competitions where public voting determines the outcome. However, Bill Tancer from Hitwise has had mixed success in predicting American Idol results and last year I failed in my attempt to use internet data (Search volumes, YouTube views etc) to predict the Eurovision Song Contest winner for 2008. The Eurovision Song Contest is a massive European event with the majority of European countries entering an act and then phone voting to establish the Eurovision winner. 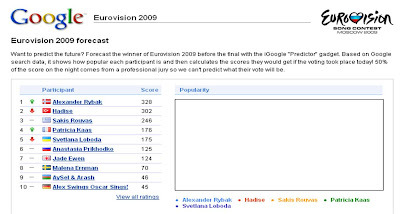 The voting is often controversial (with tactical voting and politics coming into play) and even though a jury mechanic has been introduced for the Eurovision 2009 vote, it should still be possible to make some predictions using Search data. For the Eurovision Song Contest 2009 Google have made analysing Eurovision Search data easy by introducing a Google Eurovision 2009 Predictor gadget. All the names in the Google Eurovision Predictor gadget have links to the relevant YouTube video which is hosted on the official Eurovision Song Contest YouTube channel. It will be interesting to see how close the Google Eurovision result is to the actual outcome, but this is a great example of how data can be used to try and give pre-event insight into potential public behaviour. This would obviously be even more powerful if social data was included and married to search data from all search engines! This is also telling on Google Trends and other Google predictor engines. It probably means that the data being picked up is not complete. Unless there is a narrow margin between victors past data should be a good indicator or the results of the contest. well; clearly that is rubbish. Everyone knows that UK will get nul points from certain selected countries and no amt of pseudo analytic insight on the basis of vid views is going to change that.